In Pakistan, the mere accusation of blasphemy is enough to spur angry mobs to violence, and human rights advocates say the victims are usually Christians. 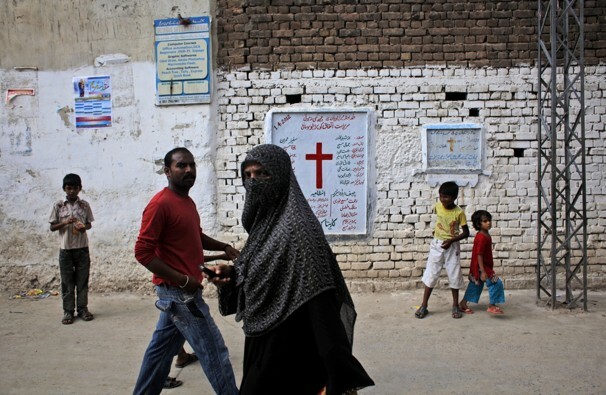 Last weekend, some 3,000 Muslims stormed Christian churches, torched hundreds of homes and burned hundreds of Bibles in a Christian neighborhood of Lahore, the country’s second largest city. It apparently began as an argument between two men, but once the accusation of blasphemy was invoked, it exploded into violence and mayhem. The violence came two days after Sawan Masih, a Christian sanitation worker , and Shahid Imran, a Muslim barber, scuffled. When Imran accused Masih of blasphemy, police and a local mosque got involved and the situation spiraled out of control. Remarkably, no one was killed. “I was beaten by the mob despite the fact I had nothing to do with what happened,” said a shaken up Chaman Masih, father of the suspect, “but I know one thing that my son is innocent.’’ Masih accused the Police of prior knowledge of the attack. In Pakistan, where Christians make up about 1.6 percent of the population of 180 million, a blasphemy conviction can bring a sentence of life in prison or even death. And a religious political party also made attempts to urged the Islamic nation’s courts to ban the Christian bible altogether, arguing that “it contains blasphemous passages that are a cause of humiliation for Muslims”. 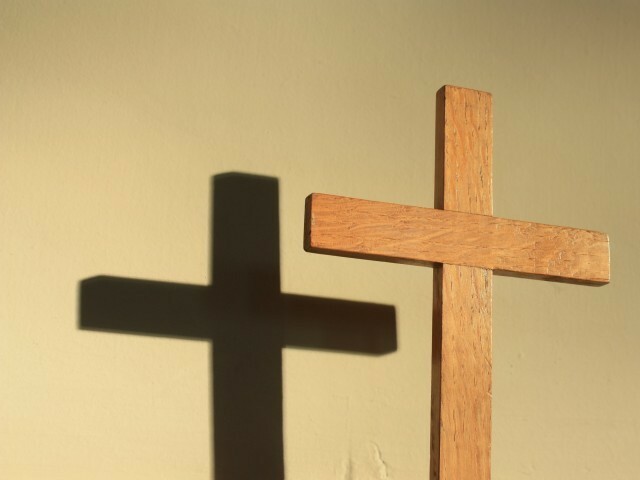 Although the nation has so far not taken that step, the sentiment provides cover for vigilante attacks on minorities, according to Christians. 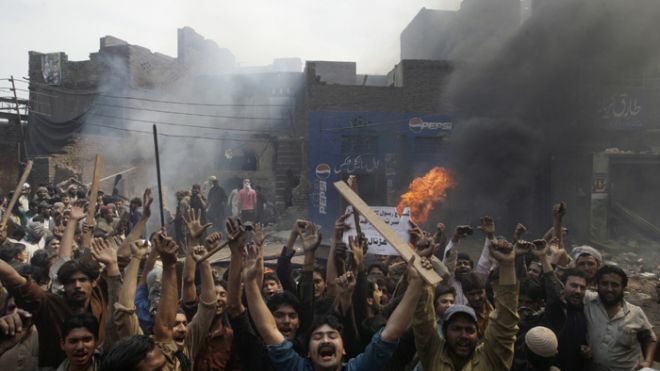 Salamat Akhtar, founding chairman of the All Pakistan Christians League, told FoxNews.com it was the mob that committed blasphemy in the latest case, by burning two churches and destroying the bibles. “We request the government to register the same blasphemy case against the perpetrators,” said Akhtar. Nearly 200 houses were burned in the Christian neighborhood, called, Joseph Colony. The destruction has left about 300 poor Christian families homeless and wondering why police, instead of providing protection, told them to evacuate ahead of the mob backlash. A senior police official from Lahore told FoxNews.com that the Christian residential colony comprises a quarter of an otherwise industrial area, and noted the factory owners have long been trying to dislodge them so they could expand their operations. After hundreds of Christians took to the streets to protest the day after the violence, Pakistan’s Supreme Court criticized local police on Monday. A hearing has been adjourned for Wednesday, but Asif Aqeel, director of Center for Law and Justice, said the courts were not likely to be able to do much. “Judicial inquiries into such incidents mostly remain useless as the administration influenced by [the] powerful government does not provide facts and dodges the judges,” Aqeel said. Though Pakistani President Asif Ali Zardari and Prime Minister Raja Pervaiz Ashraf both have ordered an investigation in to the attack and condemned it, Christian activists are skeptical. “The government, courts and institutions are not serious about our plight and after so many incidents, our confidence level is decreasing,’’ Naila Diyal, chairperson of Christian Progressive Movement, told FoxNews.com. A Pakistani judge granted bail Friday to a young, mentally challenged Christian girl accused of insulting Islam for burning pages of the religion’s holy book. Rights activists welcomed the decision after calling for her release since she was arrested three weeks ago. The case has focused attention on Pakistan’s harsh blasphemy laws, which activists claim are used to persecute minorities and settle personal vendettas. Judge Mohammed Azam Khan set bail at 1 million Pakistani rupees, or about $10,500, a significant sum in a country where many families live on only a few dollars a day. The girl’s impoverished family may need outside financial support to free her. The young girl, who is reported to be 14 years old and suffering from some form of mental impairment, was arrested after an angry mob showed up at a police station in her neighborhood in Islamabad and accused her of burning pages from the Quran, an act punishable by life in prison under the country’s harsh blasphemy laws. Her lawyer has denied the allegation. In an unusual twist, police arrested a Muslim cleric from her neighborhood a week ago after a follower from his mosque accused him of stashing pages of a Quran in her bag to make it seem as if she burned them. He allegedly planted the evidence to push Christians out of the neighborhood and is now being investigated for blasphemy himself. He has denied the allegation. The head of Human Rights Watch in Pakistan, Ali Dayan Hasan, praised the judge’s decision to grant the young girl bail. This petition will be sent to the Pakistan Government at the highest levels. “Whilst the Burmese’s treatment of the Rohingya is indeed appalling and deserves condemnation, our minorities are living in their very own Burma right here in Pakistan. “As the rest of the country goes about its way, having just celebrated another joyous Eid, spare a thought for a little girl with special needs, languishing in a juvenile jail. “She is probably all alone, and scared. With her condition, she very well might not even know the reason she is in there. “But ask her neighbours, some who are frothing at the teeth to have a go at her, and they will tell you that she deserves to die. 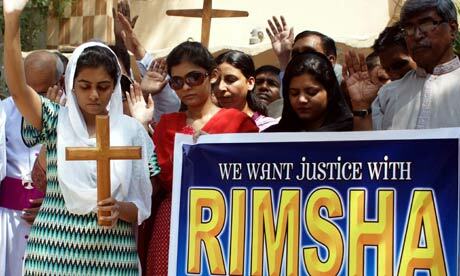 “Rimsha Masih, an 11-year-old Pakistani girl of the Christian faith, who reportedly suffers from Down Syndrome, was arrested on allegations that she had desecrated the Holy Quran. 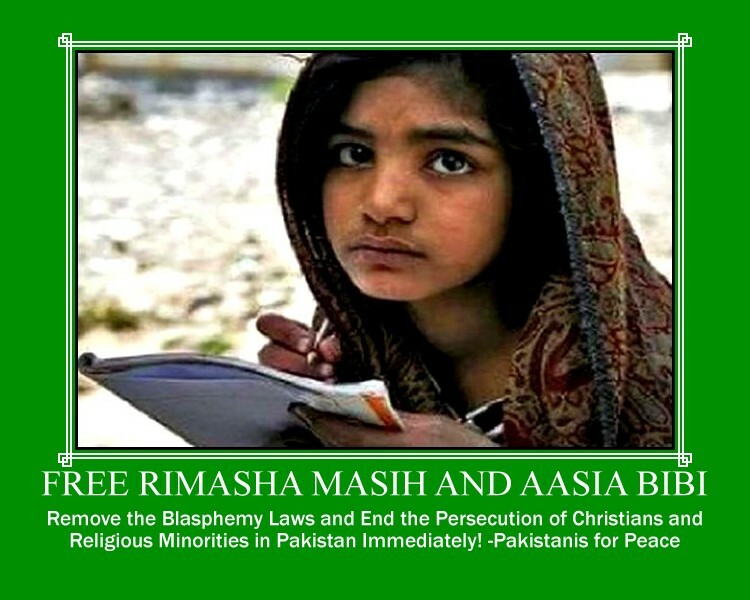 Please sign the petition and help free Rimsha and Aasia Bibi and put an end to Pakistan’s Blasphemy Laws. A Christian girl was sent to a Pakistani prison after being accused by her furious Muslim neighbors of burning pages of the Islamic holy book, the Quran, in violation of the country’s strict blasphemy laws. A police official said Monday there was little evidence that pages of the book had been burned and that the case would likely be dropped. But hundreds of angry neighbors gathered outside the girl’s home last week demanding action in a case raising new concerns about religious extremism in this conservative Muslim country. Under Pakistan’s blasphemy laws, anyone found guilty of insulting Islam’s Prophet Muhammad or defiling the holy book, or Quran, can face life in prison or even execution. Critics say the laws are often misused to harass non-Muslims or target individuals. 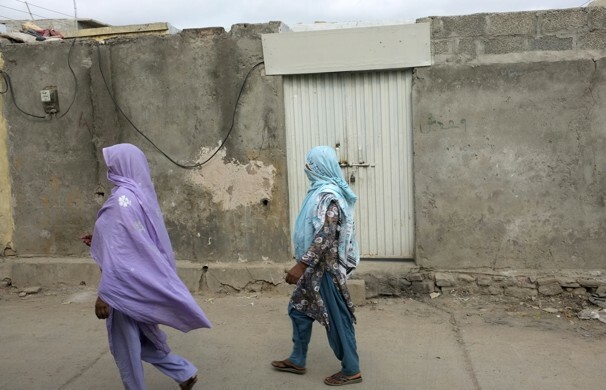 “About 500 to 600 people had gathered outside her house in Islamabad and they were very emotional, angry and they might have harmed her if we had not quickly reacted,” Ullah said. Almost everyone in the girl’s neighborhood insisted she had burned the Quran’s pages, even though police said they had found no evidence of it. One police official, Qasim Niazi, said when the girl was brought to the police station, she had a shopping bag that contained various religious and Arabic-language papers that had been partly burned, but there was no Quran. Some residents claimed they actually saw burnt pages of Quran — either at the local mosque or at the girl’s house. Few people in Pakistan actually speak or read Arabic, so often assume that anything they see with Arabic script is believed to be from the Quran, sometimes the only Arabic-language book people have seen. But one police officer familiar with the girl’s case said the matter would likely be dropped once the investigation is completed and the atmosphere is defused, saying there was “nothing much to the case.” He did not want to be identified due to the sensitivity of the case. In Washington, State Department spokeswoman Victoria Nuland called the case “deeply disturbing”. “We urge the government of Pakistan to protect not just its religious minority citizens but also women and girls,” she said. The Associated Press is withholding the girl’s name; the AP does not generally identify juveniles under 18 who are accused of crimes. “It has been exploited by individuals to settle personal scores, to grab land, to violate the rights of non-Muslims, to basically harass them,” said the head of the Human Rights Commission of Pakistan, Zora Yusuf. 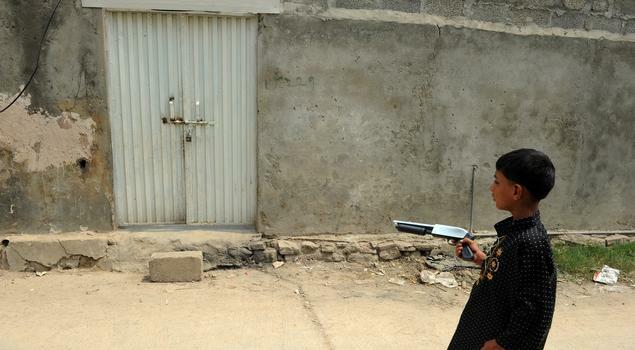 The girl’s jailing terrified her Christian neighbors, many of whom left their homes in fear after the incident. One resident said Muslims used to object to the noise when Christians sang songs during their services. After the girl was accused he said senior members of the Muslim community pressured landlords to evict Christian tenants. “Their priest should tell them that they should respect the call for prayer. They should respect the mosque and the Quran,” said Haji Pervez, one of several Muslims gathered at the local mosque less than 100 yards (meters) from the grey concrete house where the Christian girl lived. “Even a 3-year-old, 4-year-old child knows: “This is Muslim. This is Christian. This is our religion,” said shopkeeper Mohammed Ilyas. Pakistanis for Peace Editor’s Note– The case of this young Christian girl is reminiscent of the case of Aasia Bibi and many other lesser known unfortunate people who have been arrested under Pakistan’s ridiculous blasphemy laws. These laws are draconian and have no place in the country’s judicial system serving only to intimidate Pakistan’s religious minorities and giving the zealots an official tool to harass the country’s Christians, Hindus and other minorities. As we have done before, we call on the government of Pakistan to do the right thing and strike these absurd laws from the books and free the individuals who have been imprisoned under these laws.